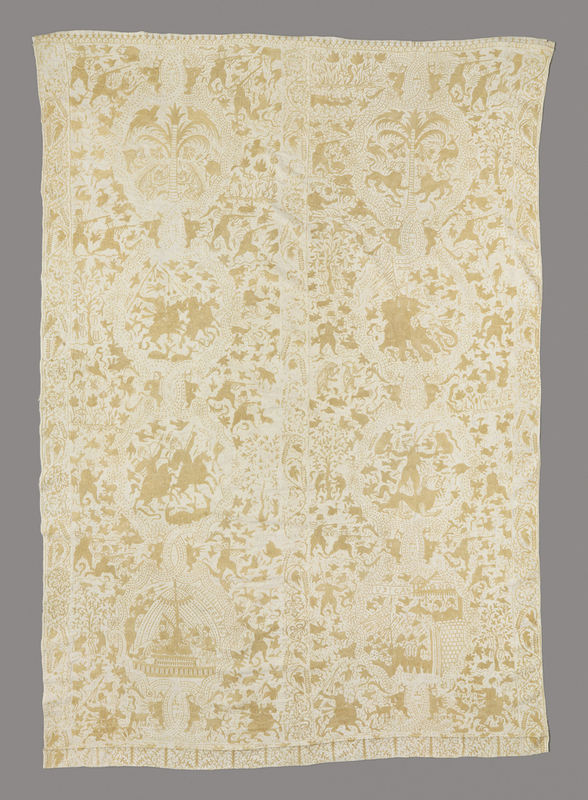 Embroidered in Bengal, India for the Portuguese market, this colcha, or bedcover, is a result of the interchange of goods and cultural influence between two trade markets. The style and materials are typical of India, but the universal theme of good triumphing over evil is illustrated through a mix of local and European imagery. Eight vignettes, framed by intertwined makara (an auspicious sea creature), depict Portuguese and Mughal hunting groups, as well as figures from both Christian and Hindu mythology. Two scenes from the Old Testament story of Judith beheading King Holofernes are detailed in the bottom vignettes. The interstices are filled with Hindu demons, trailing vines, and European hunters in pursuit of animals. This tendency to fill the space mirrors that of Indian temple decoration. The yellow tussah silk used to embroider in kanthe style – with chain stitch and back stitches – is indigenous to the region. This type of embroidery was brought back to Portugal for use in the home, and through trade, became popular in other European countries. Coverlet, India, 17th century, cotton embroidered in tussah silk, Gift of Marian Hague, 1947-50-1.